Seen Poppin’ Up in the Local Cereal Aisle! HERE’S something that the one-post-every-eight-months cereal blogs are too lazy to cover, but not me, brother! Not me! You’ll find new content here (such as it is) that you can set your watch by, on schedule, right on time, precisely every once in a while! So I was in my local discount grocery store…? You know the kind – the produce is cheaper (and more mottled with blemishes and fæces from the hands of whoever picked it)…and all the other stuff is the exact same price if not higher, but they give you the illusion of it being a bargain by displaying everything in the cardboard cartons they were shipped in with the front cut off…? And like you, I thought it ridiculous! 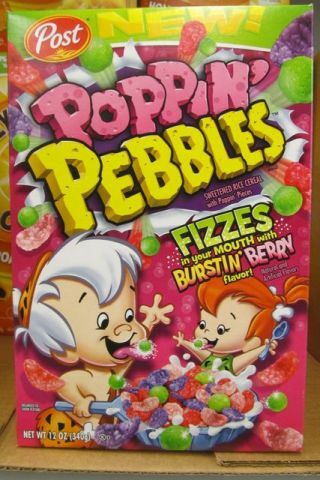 Why, these “Poppin’ Pieces” that “fizz in your mouth with burstin’ berry flavor” are nothing but glorified Pop Rocks! Over-sweetened candy commingling with nourishing rice cereal – someone thought this was a good idea?! No thank you, I’ll stick with my healthy breakfast ritual. 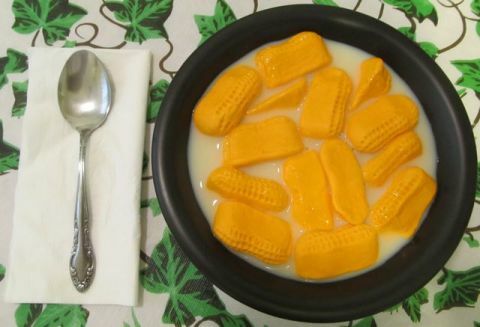 A great big bowl of Cap’n Crunch’s Oops! All Circus Peanuts. It’s a delicious part of a balanced breakfast. Posted by Ted on November 14, 2014, 9:33 AM.